Tools that help providers to collect discrete data on a population of interest (such as longitudinal studies). This may include documentation flowsheets and SmartForms as well SmartSets that help populate Epic data fields in a standardized way. It may also include automatic calculation of patient scores. Alerts that identify specific patient subsets in the clinic setting. This may include alerts that a patient may qualify for a research study or that important clinical data is missing for a specific study participant. There are many other potential applications for customized Epic build which we can identify during an initial consultation. Initial Consultation, during which we define the specific Epic content build that is required for your study. Besides identifying the optimal Epic tool(s) we will also discuss how such tools may change the clinical workflow and whether such a change is feasible in your clinical environment. This is a very important aspect of the program, since failure to consider potential operational obstacles may lead to unsuccessful application. Furthermore, we will provide you with a rough time estimate for completion of the Epic build. At the end of the consultation we will provide you with a scope of the proposed project. Obtaining IRB approval. Before any customized Epic build can be started, IRB approval is required. Funding: This is a required component to access PACE services. While we will provide an initial consultation for your proposal for free, the subsequent Epic build, testing and maintenance is a fee for service program at a rate of $118/hour. If you are planning to incorporate PACE services in a future research project, we strongly recommend to include respective costs in your grant proposal for internal or external funding. Epic Build: This step will include the time it takes to build and test your customized Epic content. During this phase we will update you with the progression of the project on a regular basis. We may contact you for additional clarification. At the end, we will present you with the product for testing in a mock-up environment. Go-live for customized Epic content: When your content is ready to be moved into the live environment we will inform you about the specific time when it is available. At that juncture, the maintenance phase of the project begins. 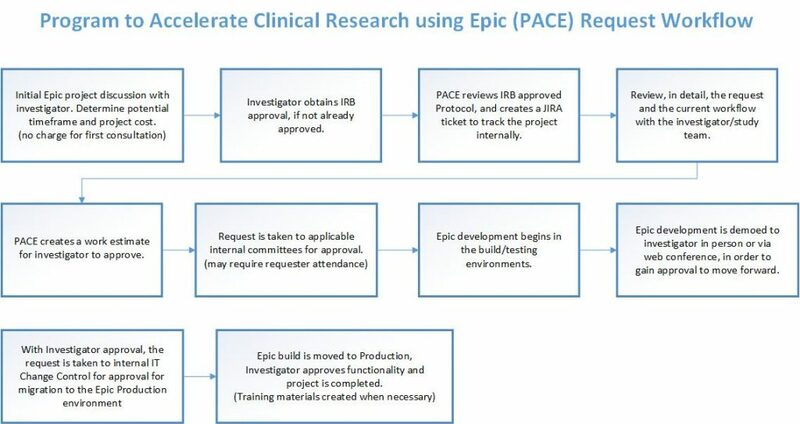 Clinical researchers may discover that they would like modifications to the original project in order to further optimize the Epic build. There may be new research staff joining the study that require access, and other changes to the build. Please understand that this is beyond the scope of the original project. While we work with you to ensure the full functionality of the original project, additional modification will acquire additional costs. We strongly recommend to include optional funds for such considerations in your grant budget proposal.